One shouldn’t be surprised to find that the pace of work at Travel Town slows down markedly around the holidays. M.177 is no exception, and while the Operating Department enjoyed a burst of publicity and subsequent activity with the annual appearance of Santa Fe Claus, I myself found scant time to work on the motorcar. With the Winton gasoline engine up and running, it’s time to take stock and think about the future. New directions, if you will. While getting the engine running represents a major step in the restoration project, there still seems left an endless flight of stairs. The work of the past year has been personally very satisfying, yet still just a bit daunting, owing to the immense task yet to come. The other factor that is just a little disappointing has been (forgive me if I allow myself the luxury of feeling sorry for myself) not having the hoped-for support of my fellow volunteers. Managing volunteers is a tricky business. It’s not like having employees, where you can tell them what to do, simply because you’re the boss. If they don’t work out, you just get new employees. With volunteers, they are quite literally bestowing a gift of their time upon the organization. It is within their power to withhold this gift. With most people, this gift is not withheld without good reason. Jobs, family, social obligations, and more all compete with the time we set aside for Travel Town. It’s important for an organization such as ours to make the time that they give worthwhile, what with all the other things people have to do to run their lives. The kind of work that has been going on recently in M.177 appeals to but a scant few such as myself. Unfortunately, a lot more dull tasks loom on the horizon. Things that require getting dirty and doing things like chipping rust and scraping paint. While I continue to make appeals to all that help is welcome, I don’t realistically expect a crowd of volunteers rushing to sign up for such things. As I said, we compete for the time of the volunteers, and they are going to do what they feel is within their capabilities and their ability to finish, and to be perfectly blunt, what is fun. Chipping rust is not fun. Because of all these things, I feel that I need to reexamine my own approach as Project Manager. I could continue to come out for a few hours each Saturday, and eventually, the project would get finished. The problem is that it would likely take many, many more years to finish, if not the rest of my life. The project has already outlived some of my fellow Associates. What is needed is to bring the project to the next logical level. This would be to depend less on volunteer labor, and more on professionals. Of course this would require just one thing — money. As Project Manager for M.177, I’ve made the decision that more of my time would be better spent devoted to fundraising, and less to the actual hands-on work. 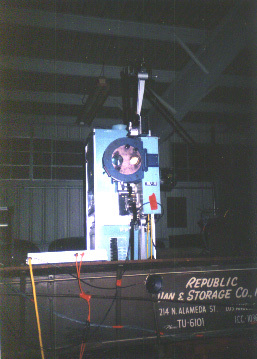 A case in point is the main generator. We need approximately $25,000 for the rebuild shop to complete the fabrication of the missing windings and to reassemble the unit. It would be far more desirable to raise $35,000 and use the additional funds to contract with a heavy equipment mover to transport and install the generator. There might even be enough left over to begin the extensive rewiring of the motorcar’s high-voltage system. Sharon Riley has been appointed fundraising coordinator, so I’ll be working with her on these efforts. In the short term, I have been soliciting grant guidelines from various organizations, and with any luck, we’ll have our generator sooner, rather than later. If you don’t see a lot of visible work on M.177 in the mean time, you’ll understand why. I have come to believe that this philosophy carries over to our organization as a whole. We need the money to make our plans a reality and to make the organization and the museum flourish. We need to be able to hire people to do the dull, difficult work, so that our volunteers can do the things that are more suitable to their interests and talents. If we want our volunteers to return year after year, we have to structure their contributions to avoid “burnout.” Perhaps some day we could even have the funding for a small full-time staff to give our volunteers the kind of support they so richly deserve. At Travel Town, we are in the business of more than restoring and preserving the rail experience; we are restoring and preserving memories. And creating new ones, for young people especially. This goes beyond the actual experience of riding on the trains, if you think about it. That's the core of it, but something that happens along with that comes with interacting with the trappings of the rail experience. For example, I find that the tokens and tickets I've saved over the years, which remind me of my rides on trains, are very dear to me. I still have subway tokens that I bought in the 70s when I lived just outside of New York City. Back then they were 35 cents and looked like a copper coin with a gold colored inset in the center. Now the price is over four times that, but still, $1.50 for a ride on such a complex system seems a bargain compared to what Blue Line riders are paying here in Los Angeles. To me, it's still worth buying an extra one to commemorate the trip. Buying extra tokens was always practical, since you never knew when you'd need one at a station where the token booth was closed or nonexistent, but I bought them because I just liked having them. Now when I find one turn up every now and then, they bring back the whole experience to me: the clatter of the cars ... the lights unexpectedly blinking on and off as the car passed over rail breaks ... the summarily prompt open-close of the doors. Or my favorite thing, standing in the front car and looking through the window into the dark tunnel, peering into a forbidding world, but still passing safely through it. When I moved to New Orleans in 1976, I lived near the trolley line, a block from St. Charles Avenue. The streetcar didn't have tokens, but once you paid your quarter, you could give the operator an extra 10 cents and get a transfer. This was a long piece of scored paper that allowed you to change to other bus lines (there was only one trolley line). The scoring make the paper break up into four or five coupons. You got on the next conveyance and held your transfer for the driver, and he tore off the top ticket. You almost never used the entire transfer up. I guess most people threw them away, but I often used them for bookmarks. I still open books in my house every so often and find an old St. Charles Ave Streetcar transfer ticket. Many times, all the coupons are intact. I only wanted the option to tranfer that day, perhaps. But I find I also gained the more enduring option to remember my many sweet rides on one of this country's last trolley lines. Last year I stopped in Chicago on the way back from seeing my family in Pennsylvania. I fulfilled a dream I've had for many years of going to Wrigley Field and seeing the Cubs play. We saw Sammy Sosa in the game where he hit his 300th career home run. The "L" train ride from the hotel was no less memorable. Chicago issues paper tokens for their subway rides. Another tangible memory marker! For all these reasons, I was glad to hear we were able to obtain more tickets for our caboose riders. We ran out this summer, and it became obvious that our riders missed this small token of their (currently!) short ride. We can't underestimate the power of such things in making the rail experience we offer as complete as possible. Complete with a reminder for later, of how much fun Travel Town is! Click on the thumbnail to see the full-size image. A lot of earth moving has gone on in the last few weeks in the tail track area. Charley's #2 engine was getting overdue for oil and filter change, but each time I tried to schedule it, I always seemed to run into conflicts with folks trying to train. Finally on October 17th, I did a quick turnaround oil change and placed the engine back in service for evening training. Charley's fuel pump has also been getting noisy and the pressure was becoming less stable. I opened the end of the pump and noticed that the gear lash has gotten excessive. As built, the other end of Charley's fuel pump motor had an identical pump used to circulate lube oil between the two engines. 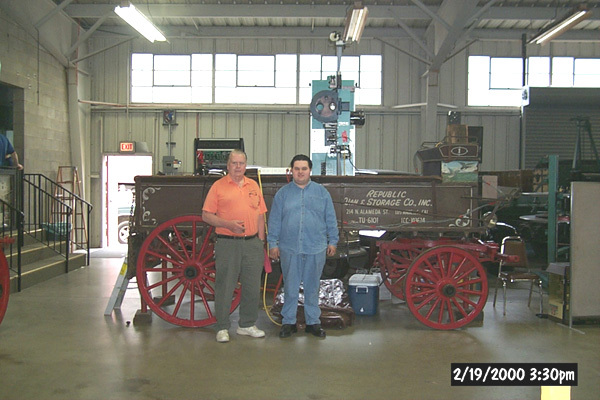 When we took the #1 engine out of the locomotive, we disabled the common oil system and placed that pump in storage. Since I anticipate it will take some research to find a replacement pump, I switched pumps and put Charley back in service. I now have time to put “finding a new pump” on my to-do list. I spent a lot of time working on the catch basin this quarter, so the only work on the Baldwin was its 90-day inspections. If you haven't already, be sure to drop by and introduce yourselves the next time you are near Travel Town! Motor Pool - Motor Pool — Brad Slosar continued to nurse the Dodge dump truck, and it is running fine but still needs some work on the PTO shaft (oil leak) and the dump body hydraulic mechanism. Thanks, Brad, for caring about this most useful piece of M/W equipment. Meanwhile, responding to the need to organize the motor pool, Tim Riley stepped up to the plate. Tim has had some actual schooling in motor vehicle maintenance, and volunteered to become the Motor Pool Manager. As such, he will be responsible for maintenance of the Association's rubber-tired vehicles. Since these vehicles support all Departments, it was decided to place the Motor Pool under the aegis of the General Superintendent. Thanks, Tim! Look for exciting motor pool news in the next issue. Battery Servicing - During the December 5th operations we noticed some voltage anomalies in Charley's battery that suggested low electrolyte level. Jim Vicars checked the levels and found them to be correct. He then checked the specific gravity of several cells and found it to be low. During the Santa Train operations on December 19th the voltage anomalies failed to recur, suggesting that someone may have failed to connect Charley's battery charger in the weeks prior to December 5th. Buildings, Equipment, and Grounds - On October 17 another group of Key Club volunteers from Burbank High School descended upon the Museum and assisted in a marathon cleanup day. In addition to the usual grounds cleanup, they helped remove spikes and tie plates from a large batch of salvaged ties, they helped sort, palletize, and band various M/W materials, they cleaned equipment, they removed assorted detritus, etc. We are grateful to the Key Club for their enthusiastic help, and we are especially grateful to Nancy Gneier who arranged the event and to Yvonne Ramsey who provided hot lunches for all. On October 23 a few more students continued the cleanup under Nancy's guidance. During the October 1999 Board Meeting, Alan Weeks suggested that the "board package" (agenda, minutes, reports, etc.) be made available for Associates who are unable to attend the meetings. This is an excellent idea. Accordingly, we will prepare a record set of the latest "board package" in a loose-leaf binder and make it available in the Restoration Yard Office to anyone interested in perusing it. We do ask, however, that it not be removed from the Yard Office. It will be available on the Saturday following each Board Meeting. We have set up a "working executive committee" comprising superintendents and project managers that will meet periodically to coordinate work schedules, problems, etc., and that will interface with the City at its periodic planning meetings. Members will be Sue Kientz (president), Jerry Price (General Superintendent), Gordon Bachlund (Mechanical Superintendent), Joe Barilari (M/W Superintendent), Jim Hoffmann (Operating Superintendent), Bryan Reese (M.177 Project Manager), Greg Gneier (Zoo Railroad Project Manager) and Greg Ramsey (Acquisitions Manager). Jerry will chair this committee. If you have questions or comments about any of our projects, please feel free to contact any of the foregoing as they will be in a position to have the latest information and to carry your suggestions forward. Also, if you have other concerns, please feel free to contact Steve DeVorkin, your member Ombudsman. Opportunity knocked on the Association's door in December 1999 as the San Bernardino Railroad Historical Society, the group that restored the mighty AT&SF 4-8-4 (Northern) No. 3751, offered us a preengineered steel building (with 10-ton overhead crane) that they had been given by the AT&SF Railway. It had been disassembled and was stored in pieces, complete with blueprints for reassembly. Bryan Reese was appointed to follow up and negotiations are ongoing. Stay tuned for further developments. I would like to take a few moments to update all concerned on the current status and progress of the Tail Track and Zoo Railroad construction project. The past six months have netted a great amount of forward progress, despite a few annoying inconveniences. 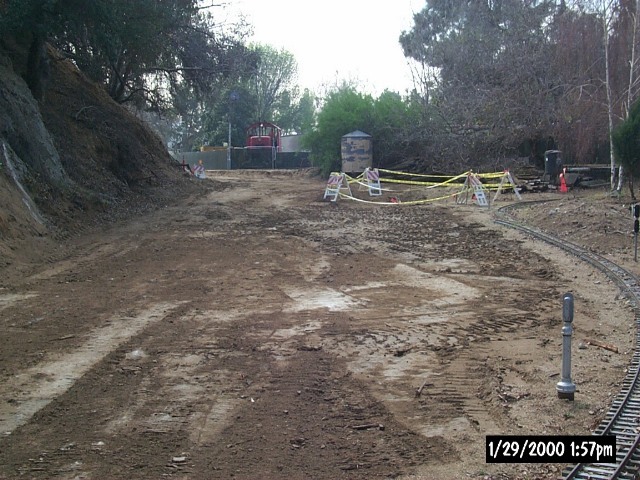 In the late summer and autumn we made a big push to complete the drainage and culvert work in the area of the “Junction Switch,” and indeed this work was completed before the end of 1999. Per the engineering plans, the existing culvert pipes were excavated and lengthened, a protective concrete cap was poured over them, and a new concrete catch basin was created. Existing drainage pipes from the main parking lot and snack bar areas were tied into the new catch basin and an extra inlet was left for a future secondary drain from the parking lot if later required. Most of the above work was done by hand and through the dedication of our hard-working volunteers. The work on the drainage project has truly been a “Travel Town effort” -- we have had great interest and participation from not only the SCSRA MofW crew but also from ASRA and SCSRA volunteers who are normally engaged in other activities around the Museum. I would like to especially recognize Greg Ramsey for his continuing involvement and assistance on this project as well as Linda Barth and Tom Breckner for their confidence and support. 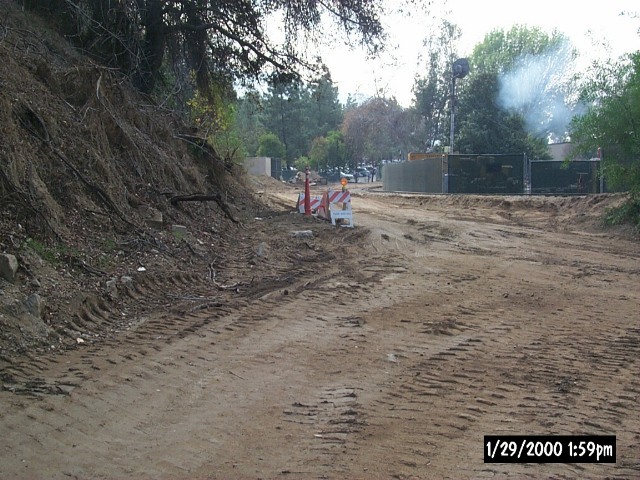 Simultaneous to our work on the culverts, the L.A. Department of Water and Power excavated and encased a 50 ft. long segment of their “Reclaimed Water Line” where it passes under the junction lead track right-of-way. They deemed this the only section of their line in the junction area which required encasement. The DWP crews were very friendly and most helpful, doing their work very quickly and providing some key assistance to our efforts as well. 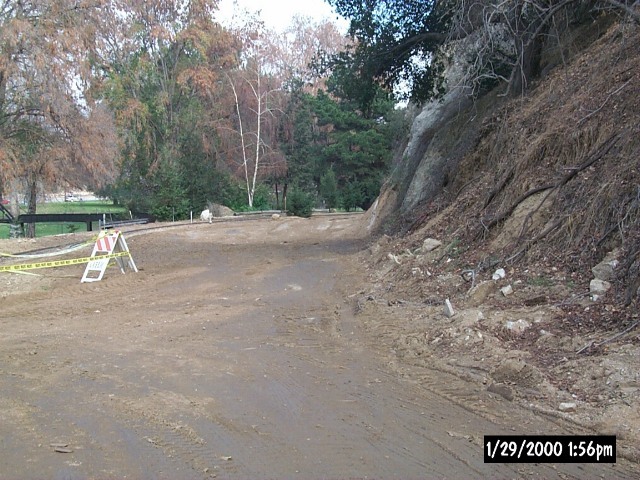 Remaining to be completed in this area is final build-up of the upper walls of the catch basin (based on final grade elevation) and removal of the surplus dirt pile on the right-of-way. The Museum administration will arrange for removal of the dirt by Park staff. [This has also been completed as of Headlight publication]. 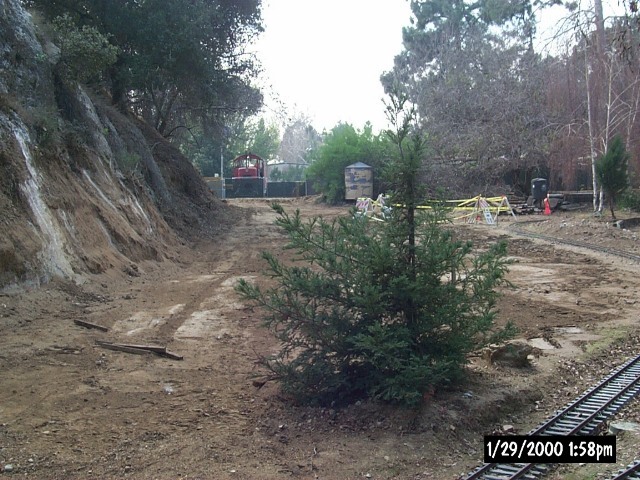 Construction of the hillside Retaining Wall. 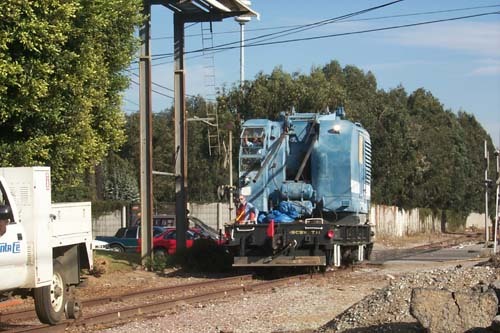 Positioning of the junction switch and creation of crossing with the miniature T.T.R.R. On Saturday, January 15, Dan Price and myself met with Boyle civil engineer Greg Crews and surveyor Bill Doran at the site to compare notes and discuss the next steps. Mr. Crews has prepared a preliminary alignment drawing for the right-of-way from the end of the tail track to the northwest corner of the LALS main facility (at Zoo Drive). The Rec & Parks Staff has submitted this drawing to the LALS for their comment and is awaiting a reply. Mr. Doran has offered his services as a surveyor to lay out the route and help us position the junction switch and realignment of the lead track. Within the next few weeks, Doran and a small crew of our volunteers will stake out the entire route as drawn, between the service yard and the LALS/Zoo Drive location, including proposed realignment of the lead track. It is crucial for us to determine the position of the Junction Switch in order to realign the lead track and position the crossing arrangement for the CS&CV vs. Miniature Travel Town Railroad. Realignment of the lead track and construction of the crossing and lift-out track panel will be the next step in the track work process. However, completion of the Retaining Wall is a prerequisite to the installation of the junction switch itself, as well as any further track construction beyond the miniature railroad crossing. I look to the coming months as a time for continued progress on the Tail Track. If we can keep the momentum going, one step at a time, we will find ourselves with rails to Zoo Drive in no time at all. The Key Control Policy was revised to recognize the need for multiple lock types to accommodate the diversity of various departments' security needs, and to place all such locks and keys under the Association Key Control Officer. Private locks are prohibited except on Associates' personal lockers in the Yard Office, and on enclosures and equipment that require short term safety lockout such as electrical equipment enclosures, circuit breakers, etc. The Personal Tool/Equipment Policy was revised to require safety inspection by and registering with the Acquisitions Manager of privately owned tools and equipment brought on the premises for an extended period, i. e., more than one day. Personal tools and equipment brought on the premises on a daily basis, to be removed from the premises at the end of each day, are exempt from this requirement. Amazing how time flies. It seems like it was just a year ago I sat in front of my computer and began typing my first Our Gang article for the Headlight. Wait a minute! It WAS a year ago this month that I wrote my first article. Looking back I don't think I could have ever predicted what would end up happening this year. I had hoped the first tracks would be laid on the Tail Track; sadly it hasn't happened, yet. Nevertheless, so much other progress has been made on the right-of-way. Earth has been moved, pipes have been laid and a catch basin has been built. However, in the past year a more important (in the short-term) track project was completed, the rebuilding of the station track we use for operations. Track — Only a small amount of track work was done this quarter. We did some touch-up work on the station track, including extending it toward the 3-foot gauge equipment. All that remains is to have more fence installed and to tamp the last 60' of track that is not used during operations. Unfortunately this has been hampered by a lack of volunteers willing to operate the pneumatic ballast tampers. Zoo Railroad — The drainage system on the tail track was finished including the capping of pipes with concrete and the construction of a catch basin. This work was completed under the leadership of the Greg-sy twins, Greg Ramsey and Greg Gneier. Thank You for your much needed assistance. Signal — The south-crossing gate continued to give us trouble this quarter. Several problems were fixed and the gates are now operating normally. However, a minor internal hydraulic leak caused the infamous south gate to leak down slightly keeping the lights blinking constantly from before Christmas through New Years. This will be fixed in the next few weeks. 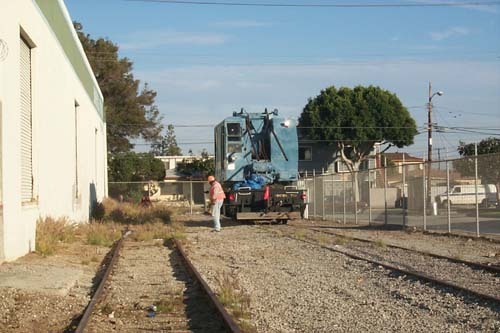 Cleanup — Most of the past few months have been spent cleaning up the track and signal material stored in the restoration yard. We expect to have all of our materials inside the yard, as well as the rest of Travel Town completed by the end of this quarter. Miscellaneous — This has been a slow quarter for the MofW Department; we have mostly been recuperating from the station track project. Also most of the department members have been busy passing their brakeman's test this quarter, including Mike Vitale, Jeffrey Barrow, Charity Lawrance, Tim Riley, and myself. Congratulations all! Many thanks to everyone who volunteered this quarter including Jeffrey Barrow, Jim Fontenot, Greg Ramsey, Tim Riley, Darlene Sexton, Mike Vitale, and anyone else accidentally left off this list. Thanks to a number of dedicated, hard-working people, the Operating Department continues to grow and mature towards the day we start moving towards the Zoo! Our staffing problem seems to be abating somewhat, and I must say that as a frequent Dispatcher, I sometimes have a bit of a problem letting everyone have a shift at his or her highest qualification level! My apologies to anyone who has been in this position. Please bear with us; as our operating track increases in length, we may start swapping crew assignments more often. As mentioned in my last report, Alan Weeks has taken on the job of Rules Examiner. He has been very busy updating the Department's personnel files and trying to get everyone's Rules Qualifications current. Letters have been sent to all whose cards had, or were about to, expire. As of the end 1999 the Seniority Roster has 29 names, and all but one are current. Those who did not respond were dropped from the roster. A big THANK YOU to Alan! Charity Lawrence, Tim Riley, Mike Vitale, Dan Price and Jeff Barrow have qualified as Brakemen. As I previously mentioned, Dan and Jeff can work during public operations under the supervision of a qualified adult conductor. Welcome aboard! Charity Lawrence and Mike Vitale were later promoted to Conductor. Darlene Sexton recently qualified as Train Service Engineer, and as mentioned in the last Headlight, we have operated with an all-female train crew! Congratulations to all! Our public operations were held October 2nd and 3rd, November 7th and 8th, December 4th and 5th, and the Santa Fe Claus Train on December 19. We have had to revise our policy regarding the issuance of Souvenir Tickets. The original intent of the tickets was to enhance the demonstration train ride and to acknowledge public donations. Apparently some members of the public thought that we were selling tickets; and thus charging for the "free" caboose ride. Although we felt that we were issuing the tickets as donation receipts, we stopped using them altogether. Public response was immediate: donations dropped, and some of our repeat customers complained. Most touching was one woman who told us that her son, who is learning-impaired, had been building a collection of tickets arranged by punch dates! We have since adopted a new policy of issuing tickets aboard the cabooses and giving them to everyone. Let's hope this puts that issue to rest! Docents — Bill Dale, Steve "Santa Fe Claus I" De Vorkin, Nicholas Di Massi, Don Flinders, Charles Forsher, Alicia Joe, Monica Macariegos, Cesar Matias, Gabrielle Messineo, Jessica Murphy, Patty Miles, Adriana Recinos, Ephram Recinos, Annette Sevigny, Ed Temm, and Jim "Santa Fe Claus II" Sexton. Apologies to anyone whose name I misspelled. Many of the above are local high school students earning community service hours. My thanks to Nancy Gneier for recruiting same. Operators — Gordon Bachlund, Jeff Barrow, Andy Evans, Jim Hoffmann, Charity Lawrence, Dan Price, Greg and Yvonne Ramsey, Tim Riley, Chris Rippy, Darlene Sexton, Jim Vicars, Mike Vitale, and Alan Weeks. Last quarter I reported to you that I sent a letter to Robert Krebs, CEO of BNSF (Burlington Northern Sante Fe), requesting permission to move our crane from its parking place at the end of track on the Alcoa Sub to our other storage location approximately 10 miles up the Harbor Sub. In early November, in response to my letter, I received a call from Dan Meyers, Division Superintendent for Southern California. He asked who had denied our request when we asked six months before and indicated that he needed to make some calls but didn't see a problem with the move. A few weeks later I got a call from David Leathers, Superintendent of Operations at Watson yard. He was calling to schedule our move. We discussed various options, and considering the distance and the speed limit on the sub, we settled on moving it under its own power with a pilot. We thought we would try and move on the Friday following Thanksgiving since the railroad would be shut down for the holiday, but Mr. Leathers promised to advise me. Thanksgiving came with no word, so Friday morning I called him back. Friday wasn't going to work so he wanted to try again Monday. Again, I was to get a call on my cell on Sunday. We had not started the crane in months and I knew the brake cylinders should be adjusted, so my son Gregory and I decided it was time to run down there anyway. A quick check of the oil and jacket water, and reconnection to the battery, and the engine roared to life. It was as if we had run it the day before. While we built up air, and with blue flag in place, Gregory and I crawled under the crane and wrestled with rusty pins and linkage. An hour later we were done and I wanted to test things. When I started, I had asked Yvonne to call around and see if she could find me a brakeman. She had been unable to locate anyone, so we shut down and secured things. Gregory and I then walked the track as far as the next crossing, clearing debris and checking that all was secure. On Saturday back at the Park, the rumor mill had it that the crane might move. Unfortunately, I knew from experience (and the RR had made it clear) that the last thing they wanted was a crowd milling around RR property or, worse yet, trying to ride. I was evasive about schedules, and truthfully, I didn't know when it really would move. Nevertheless, I did spend part of the day gathering up marker lights, flags, and other items that I thought would help the move go smoother or indicate we ran a safe operation. On Sunday, this time with Yvonne with me, I again paid a visit to the crane. We started the engine and again started to build air. Over the months, the track in the area of the crane had been overgrown with tumbleweeds, so it took us both to open the gates. After a standing brake test (the crane only has independent brakes) I put into low and started to crawl up the hill. Didn't make it more than 100' before the two drive axles started to slip. I find it amazing how much moisture is contained in those "dead" weeds. I backed it back down into the yard, and then took another 1mph run at it. This time I cleared the weeds and slowly climbed to the top of the hill. I knew if I was to go fast enough on the Sub to keep from blocking traffic, I would have to be able to shift all the way to 3rd gear. It took some groaning, some cussing, and more than a little struggling, but I was finally able to get it to shift through all three gears. We again backed it into the yard, and shut things down one again and headed for home. By the time I got home, it was late afternoon and I still hadn't received the expected call. Nevertheless, I wanted to be ready, so I started to call a few people to find a brakeman and a driver/photographer. By the evening, I had Jim Vicars lined up to be my brakeman, but was having trouble finding someone who could take the time off work to drive the chase car and photograph. I had an 8 a.m. meeting on Monday, so I went in early and immediately called Mr. Leathers. He confirmed that we would make the move today and wanted us ready to roll at 1300. [Notice how Greg’s military brain kicks in. Ed.] I immediately called Jim and arranged to meet him at 1100. I then again tried Darlene Sexton and this time found her available. I also arranged to meet her at 1100. With my crew assembled, I rendezvoused with Jim in Hawthorne, and Darlene and Annette in Torrance. Shortly before 1 p.m., the BNSF Mechanical Representative showed up. Jim and I had already started the crane and I was oiling around. He watched me finish then requested I do a set and release. Satisfied I could stop and would not burn off an axle, he called someone and told them all was ready to go. Shortly after 1 p.m., Mr. Leon Parnell arrived with his high rail pick-up. He was going to pilot us along BNSF’s trackage. While he inspected the branch track in front of us, his assistant drove around and down to the next grade crossing to get on the track. Satisfied that the track was clear, he called back to the mechanical rep and told us to proceed, prepared to stop on his signal. We started the climb up the first hill. It was too steep to attempt to shift so we crawled up the first half-mile at a rip roaring 1 mph. As we crested the hill, I attempted to shift gears. Unfortunately, the crane decided now was the time to get difficult. I successfully moved the lever from 1st to 2nd and started to engage the clutch. The crane lurched to a stop and stalled. What had happened was that the crane had engaged both gear sets at the same time, effectively locking the transmission. With a fair amount of kicking, grunting, and swearing, I was able to get it back into first, and I decided to warm the transmission some more before I tried to another shift. I rolled up to the first bridge and with everyone watching, slowly creeped across. The bridge behind me, I rolled to a stop at Van Ness. The highrail was still being aligned with the rail, so I held back of the crossing circuits until he was ready. In just a few minutes, they gave me the highball and proceeded down in front of me clearing shopping carts and other debris as we went. I made another attempt at shifting, and again locked things. This time with a lot more swearing, rocking it into reverse and forward, and a few gallons of sweat, I finally got it to see things my way. I got it rolling in 2nd and finally started to close the gap between the highrail and me. 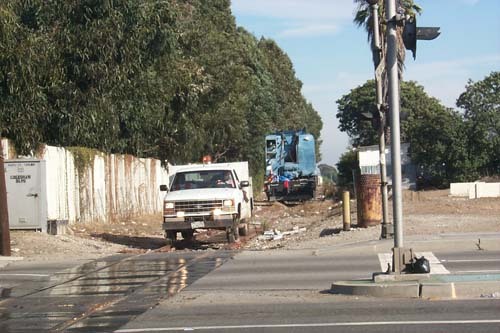 I even briefly put it into 3rd after I crossed Crenshaw, but had to drop down as I came to the junction with the Harbor Sub and had to stop and wait for a southbound freight. The SCSRA is sad to report the passing of Mr. A.E. Roach, a loyal associate and long-time supporter of our projects such as the M.177. Our sincere condolences to his wife, family, and friends. We have always appreciated Mr. Roach's association and support. Although he lived in Virginia, we were fortunate to enjoy a long-distance sharing of our common love for rail history and especially the restoration of the M.177. The SCSRA’s old P.O. Box at the Verdugo Viejo Station in Glendale (P.O. Box 11216, Glendale, CA 91226) is now CLOSED. If you usually receive Association-related mail at the Verdugo Viejo address, please be sure to advise your correspondents of the Griffith Station address, or your mail will be returned. Always check that all Yard gates are locked. Don't assume that someone else locked up. Always leave switches lined for the "main line." Do not remove equipment or parts without prior approval.